HOUSTON (KTRK) -- Head west! More than 62,000 parking spots are available for Super Bowl-related events, but you are encouraged to park on the west side of downtown and ride the Special Event Circulators (Greenlink shuttles) to get to Super Bowl LIVE and other fan events, January 28 - February 5, every 7 - 10 minutes. 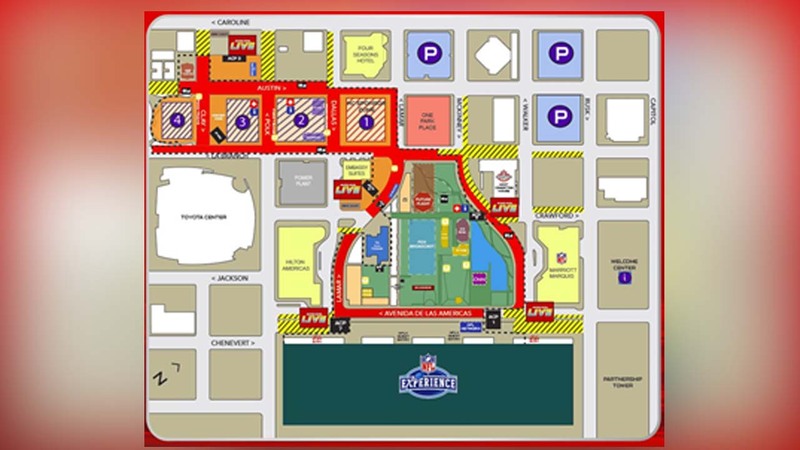 The route connects parking options on the west side of downtown Houston to the entrance to Super Bowl LIVE in and around Discovery Green. Make sure you plan ahead -- certain lots may not be utilized in their normal capacity. If you are coming downtown during regular business hours, Monday - Friday, approximately 12,000 parking spots are designated for fans during that time. Parking lots with availability will be on the Host Committee Website and on the Super Bowl app. The parking pass can be printed or scanned through the app providing turn by turn directions to the lots.